Spencer here: The first set of pictures chronicles some of the adventures my sister and her partner and I had a few weeks ago. It was a grand time. In my journal, a stream of consciousness two pages long still didn’t encompass all the things we managed to see and do while they were here. I just hope they had as good of a time as I did! A few highlights… We hiked out one morning to Warrior Rock Lighthouse at the end of Sauvie Island. I hadn’t done this pleasant stroll before and now I want to take Billy there. It is mostly through river area, Alder trees and farmland, and at the time smelled very sweet. The leaves were golden yellow and bright orange–a pretty good Fall showing for the Pacific Northwest, to two visitors from the Midwest, which I think boasts some of the most magnificent tree colors rivaling New England! In any event, we also managed to eek out a trip to the coast. Ryan was in the mood for pancakes, and we found some at the end of Lincoln City. Awesome! We made our way to the Sylvia Beach Hotel in Newport. What a fantastic find. The hotel is very strange, although could have been more strange. We had the ‘Ken Kesey’ room, (the famed author of One Flew Over the Cuckoo’s Nest). All the rooms were named and decorated as such, after famous literary figures. I was tempted to stay in the Oscar Wilde room. Maybe next time. We toured lighthouses, the bay, the beach, Rogue Brewery–where we became honorary ‘Rogue Citizens’–an awkward, but festive affair ending with a dollar off each beer and a ridiculous ID card. We wandered over to an Irish Pub and then landed at a local spot called ‘The Sand Bar’. We met a wayward traveler, (a ‘drifter’ as Ryan liked to call him), named Tyrone. When I told Tyrone I had a hamster once named Tyrone he didn’t flinch. We played some pool and tried to keep up with his stories as they jumped around more than steel head in Tillamook Bay. Where was he from? It was hard to tell, but he spent time in Hawaii, the Midwest, maybe Florida and had a house in Newport. He said he came to Oregon originally to surf, as he heard there weren’t any sharks. Well, that was the year a guy got his board bitten in half, with an arm attached. “There are sharks”, I said, “but you’re more likely to get hit by a bus.” This didn’t persuade him. I almost took Ryan and Al surfing. The weather was good–a little chilly–but its the Oregon Coast–its always a little chilly. I showed them Otter Rock, where Billy and I love to surf. Next time. We had more IPAs to find. Among the catching up, we did manage to squeeze in a quintessential Portland thing–riding bikes, bar hopping to local micro-brews. I love how my sister and Ryan are up for anything! Next up: Billy and I at a secret locale… Since Billy has been super busy with school and work, he missed the epic trip to Newport. Thus, we took our own trip to the coast, near Manzanita, and we camped out a night to give him a bit of a ‘vacation’. Contrary to what it seems, Billy did not study on this trip! We got to our secret camp spot late, leaving Portland after class and were sad to discover one of our secret camp spots was taped off. It was dark and we were running out of gas, so we decided not to investigate. We found a gas station instead and continued on to our backup spot. All worked out in the end. In the morning, we hiked around on the beach at Oceanside, munching a lovely hot mid-day meal in the sunny parking lot like a tailgate party–complete with beer, wine and coffee! We then decided to head to Cape Meares lighthouse. We saw the ‘Octopus’ tree, I was caught being a tourist, and then we found an amazing little path to a secret cove. I stopped the jeep and looked down the rocks–spotting basically a dark hole in the bushes and I sniffed out the trail. Turns out it was a locally known spot–the trail itself kept up by volunteers and lovers. There were many crab shell, rock, driftwood, chalk drawing shrines and a strange human-made waterfall/drainage. Anyway, it was a good sunny spot, in which we stayed and relaxed in lawn chairs until dark. 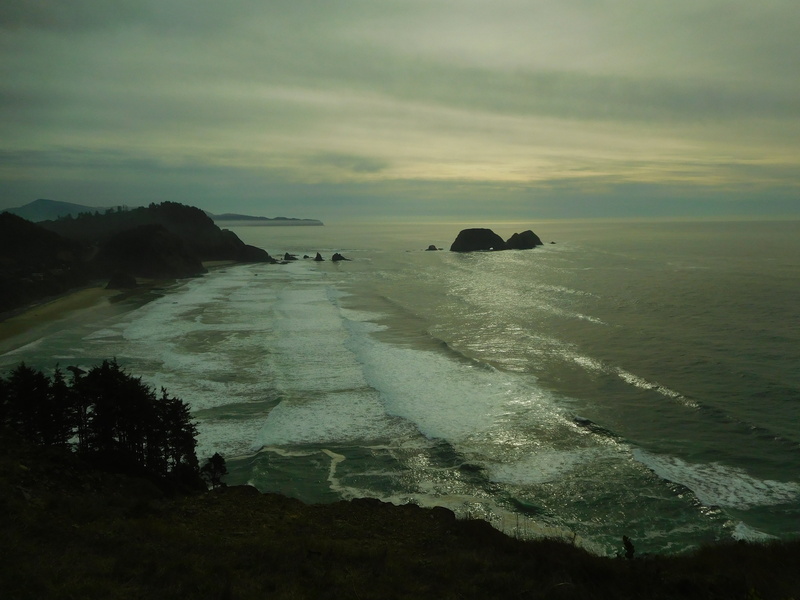 This entry was posted in Autumn, Hiking, Nature, Photography, Writing and tagged Cape Meares, Ken Kesey, Lincoln City, Manzanita, Newport, Nye Beach, Oceanside, Otter Rock, portland, Rogue Brewery, Sauvie Island, Surfing, Sylvia Beach Hotel, Warrior Rock Lighthouse, Yaquina Head Lighthouse. Bookmark the permalink.